Want to own a tank but not quite ready to make the full financial investment? Float now and pay your tank off over time with our special financing options, available through Paypal, for US customers with approved credit. You'll be taken to a screen that looks like this. Either login to your existing Paypal account or Create a new one. 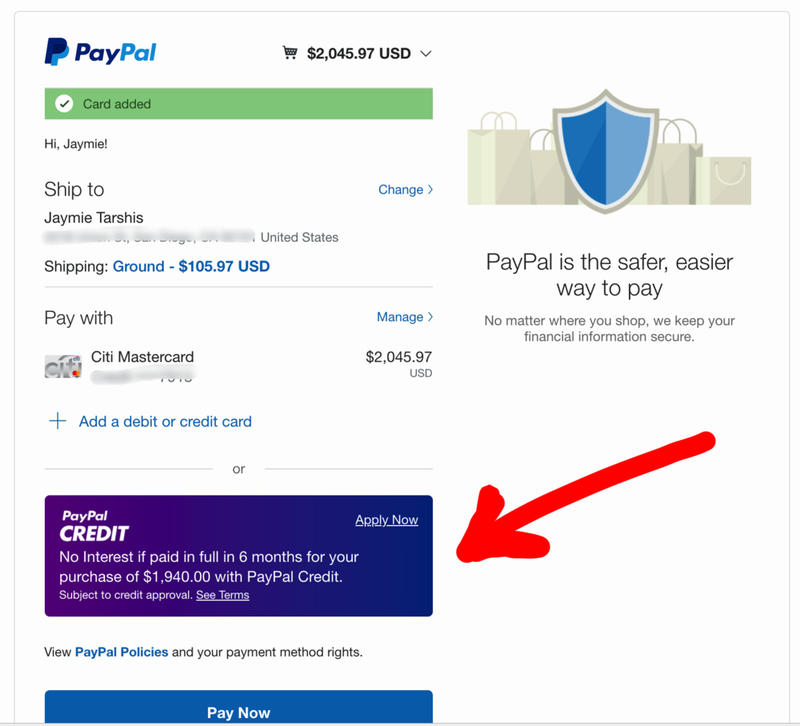 From this screen click the Apply Now link in area for Paypal Credit instead of choosing to pay with your bank or credit card information. Just answer two quick questions and accept the terms.Get A Decision In Seconds. As soon as you place your order you'll receive an email from us with your confirmation details. Or just make the minimum payments until you've paid off your purchase and pay the accumulated interest from the posting date (usually within a few days after your purchase date). Log in to PayPal.com to check your account information at any time to keep track and make payments. We'll also email you when your monthly statement is ready to help you stay on top of your purchases. If you don't want to pay before the promotional period ends, you will owe the interest that has accumulated at an Annual Percentage Rate (APR) of 19.99% starting from the posting date (which is usually within a few days after the purchase date).